This brief was one of those tricky balancing acts. 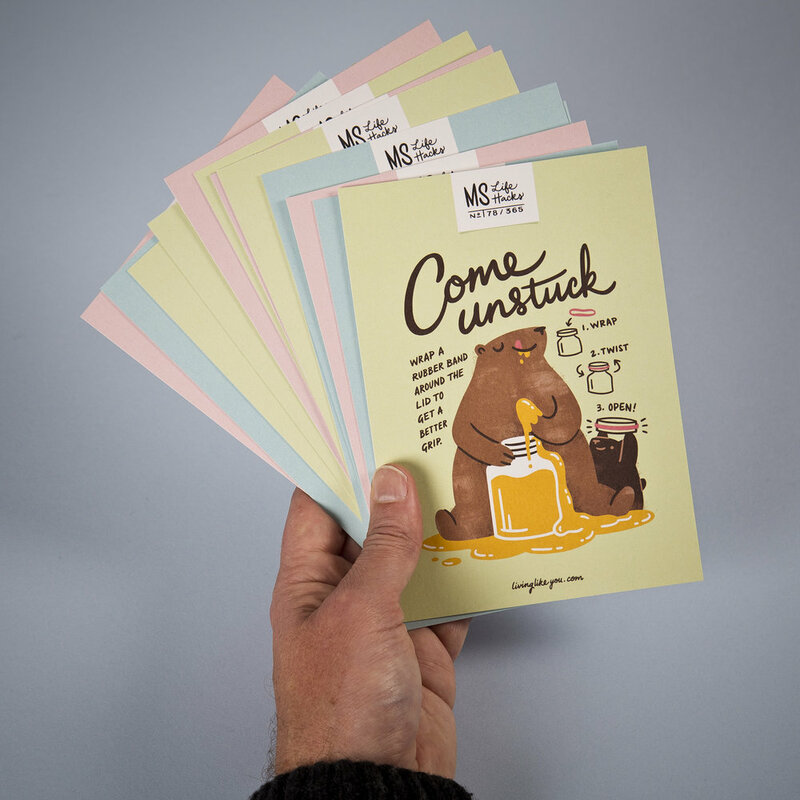 Ironically for a digital product, it was a completely analogue piece of creative – but one that became a lovely opportunity to do some good old-fashioned print craft. Global pharmaceutical company Novartis created Living Like You, a website designed to support people with Multiple Sclerosis. The New Zealand office was keen to promote this site to New Zealand patients, but had no budget or local infrastructure for digital, or a targeted brief. The site itself has a variety of functionality and features, so the first challenge was how to convey all of them in a paper-based execution. The solution was classic advertising simplicity – just don’t! Zeroing in on a single aspect of the offering was the best way to drive a clear conceptual route. Or to put it another way, stop stressing about how to say everything, and concentrate on saying one thing well. This was a great internal reminder to myself at the time, too. It’s easy to let the ‘noise’ of being a creative director get in the way of actually thinking about the creative. That one thing was the MS Life Hacks series – 365 tips, tricks and tools to help the day-to-day challenge of the disease just that little bit easier. Some are quirky, some are obvious, but it’s simple, quick and engaging. Plus an easy way to open the door for audiences to delve into the rest of the site’s content. Turning clickable page elements into some form of engaging print was simple, in retrospect. You can give them out in packs, put them on a rack at clinics, put them in tote bags at conferences…and obviously, send them to someone in the post. Seen in isolation from the site, the functional photography used to depict each Life Hack would have been uninspiring. So the second solution was to use illustration. I’ve worked on MS-related briefs on both sides of the planet now and it’s always so damned earnest, if not bleak. It’s a terrible condition to live with, but people are people and they’re bigger than their disease. So I thought they deserved, and would appreciate, a little joy. This is where the process really became collaboration, not just commerce. Illustrator Natasha Vermuelen not only brought her unique whimsical drawing style, charm and character to the project, but also her own ideas, with a level of openness, initiative and input that I really treasured as an art director. If you’re putting lotion on your back, well of course you need to have a crab to hold the bottle! As an art director / creative director, you know things are going well when you get shown great work that you know you wouldn’t have come up with yourself. Or wish you had! As usual I poked the client to make this a grander affair, with digital competitions and installations and beyond (all depicted with one of my infamous flow diagrams), but it wasn’t to be. Nevertheless, to have gotten three immaculate – and more notably, especially in the healthcare niche, fun ­– illustrations executed and out there (on an eco-friendly stock, of course) was gratifying. From what I heard before I left New Zealand, the community nurses (always the best barometer of tone of voice for healthcare patient communications) who had been given the packs to then dispense to their patients were really, really pleased. From a conceptual and art direction aspect, this has been my favourite piece of work from my time at Essence.